← Promo Efforts–What Really Works? 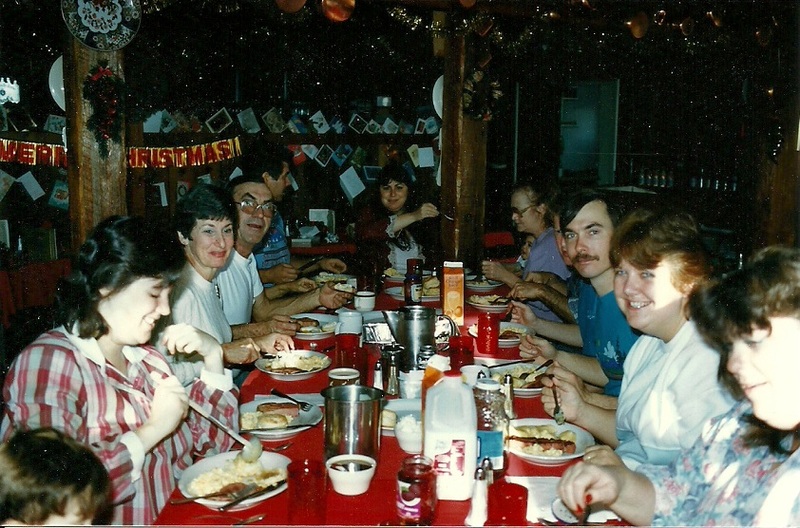 That’s me, front left, 7 months pregnant with son number 2, ladling some of my grandmother’s fabulous gravy. In my family, any holiday was an excuse for a party, and usually included a table full of food. New Year’s Day was ham and potato salad, Easter featured deviled eggs and bunny cakes (and plenty of candy since Lent had ended), there were special meals for Mother’s Day and Father’s Day, barbecues for Memorial Day, softball games in the park for 4th of July and fireworks and hot dogs after, Labor Day was a last hurrah after summer, we all dressed up in costumes and ate more candy for Halloween, and the table would groan with turkey, mashed potatoes, stuffing, gravy, cranberries and pumpkin pie for both Thanksgiving and Christmas. If any month didn’t have a holiday (or even if it did), we celebrated birthdays, lots and lots of birthday, each one with its own cake and party. So it’s no surprise that when some author friends suggested we do a joint holiday anthology, I jumped at the chance. Five of us contributed lovely, happily-ever-after stories to the Celebrate! anthology (buy it here), spanning five holidays throughout the year. Since they’re short stories between about 30 and 60 pages each, they’re quick reads, but each one is long enough to feature a satisfying romance. They’re kind of like little, bite-sized romance novels, like that gooey Cadbury egg you might savor at Easter or a luscious truffle you enjoy at Christmas. Take a taste of the holidays with Celebrate! Buy it here. This entry was posted in Books, Family, Promotion & Marketing, Traditions and tagged 4th of july, awakening, barbara mcmahon, celebrate, christmas, clean burn, debra salonen, fathers day, hangtown fry, hanukkah, independence day, karen sandler, Linda Barrett, mothers day, rebellion, rogenna brewer, TANKBORN, tankborn trilogy, thanksgiving. Bookmark the permalink.